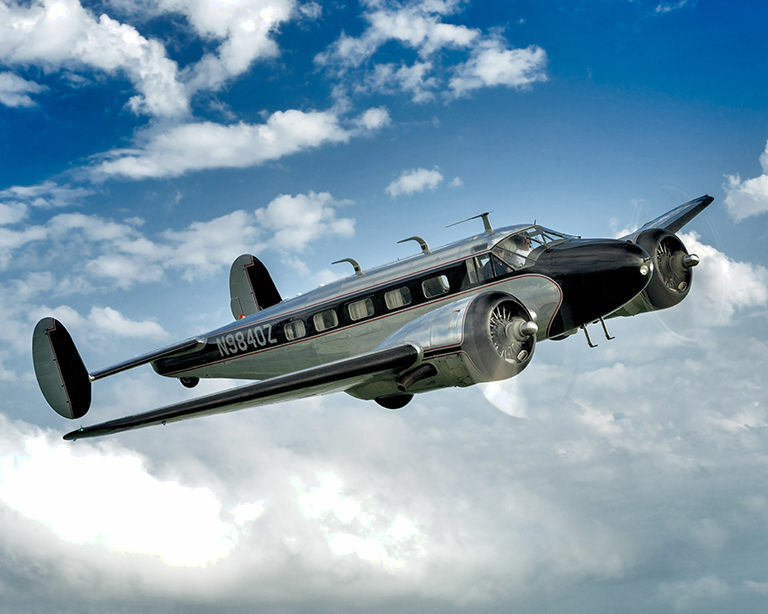 The Beechcraft C45H is one of the post war variants of the original Beechcraft C18 of the 1930’s. The C18 has been an aircraft that has seen a great many modifications and models over its thirty three years of production from 1937-1970. It is an aircraft that is small enough to be privately owned yet large enough to provide lounge-room traveling comfort for a few people. So the C45H we are featuring is set up as a corporate aircraft and as such provides a stylish private aircraft for those for whom a private jet is just not stylish enough. 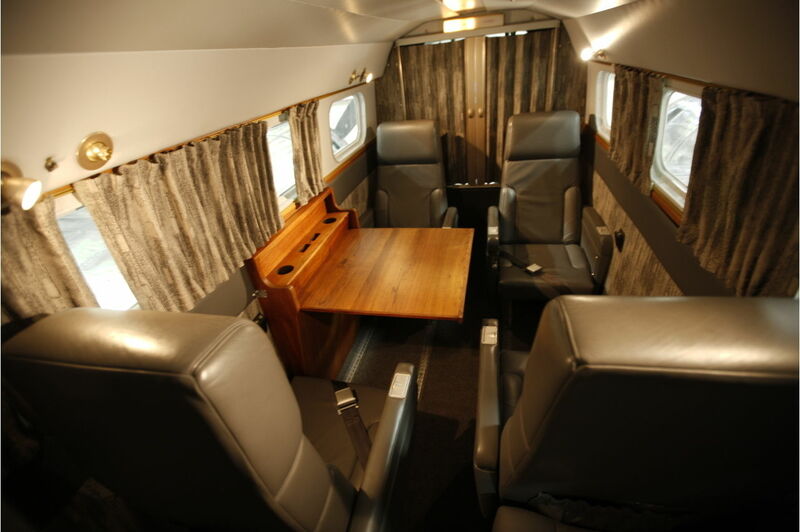 The interior of this C45H is comfortably furnished for four passengers, plus crew. (Picture courtesy Trade-A-Plane). Amongst the nine thousand Beechcraft C18 (or “Twin Beech” as they are often called) have been aircraft used for military purposes, passenger aircraft, sea planes and ski planes, and as corporate executive aircraft. Originally fitted with twin 330-hp Jacobs L-6 engines, then 350-hp Wright R-760Es, and finally 450-hp (336-kW) Pratt & Whitney R-985 in the pre-war era. The aircraft have had various engines fitted in the post war era including turbo-prop engines, but our feature C45H was fitted with R-985-AN-14B engines being an ex USAF re-built aircraft. Additional seating behind the four main seats allow the aircraft to carry nine. (Picture courtesy Trade-A-Plane). 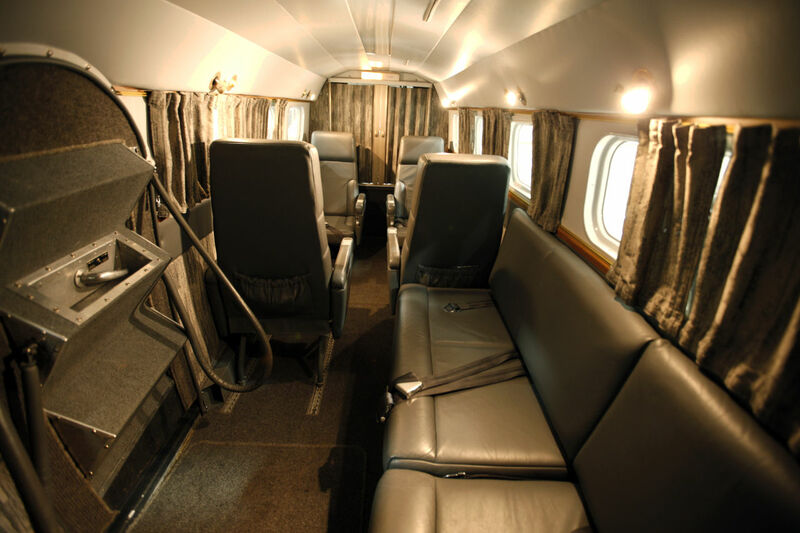 This aircraft has been purposefully set up for comfortable private travel so it has super soundproofing and long range fuel capacity in addition to the comfortable seating, table, and wood trim reminiscent of an old fashioned Jaguar motor car. The “dashboard” does not have the wood veneer of a Rolls-Royce but it manages to look rather impressive without. (Picture courtesy Trade-A-Plane). For the technically minded this aircraft is described by the vendor, Trade-A-Plane as; “Fresh IFR! Garmin Stack! GMA340, 6 place Intercomm GNS 430W, GNS 530W, GTX 327, S-Tec 50 3 Axis auto pilot with altitude hold. Full auto-pilot approach capable. Captain’s instruments includes Sandel HSI, Stby DG, Stby King LOC/GS Indicator. 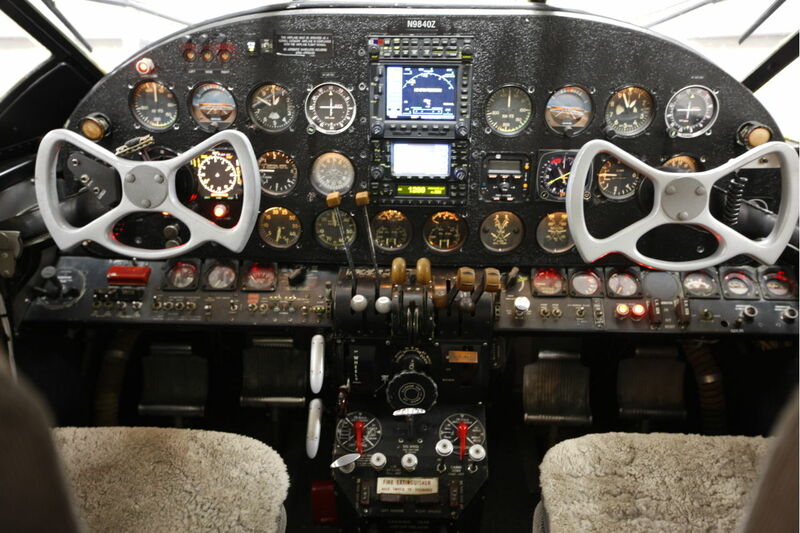 Co-pilot Instruments include Bendix NSD360 HSI, Stby DG, Stby King LOC/GS indicator, Hobbs meter.” So as you can appreciate this might look like a thirties vintage aircraft but it has an impressive list of modern capabilities. The effect of polished aluminium and black with red trim makes this an eye catching and stylish piece of transportation. (Picture courtesy Trade-A-Plane). 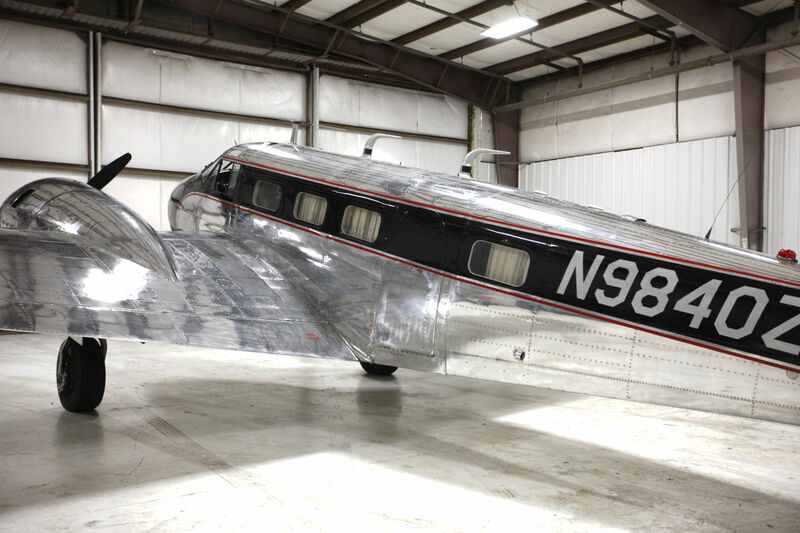 So if you are a vintage car aficionado, or a vintage aircraft aficionado, or both, this C45H presents an opportunity to own something that is rather less expensive than a classic Ferrari and arguably something that will add a fresh dimension to your collection. Asking price is USD$279,000.00, which is the sort of money one could buy a modest house for, or a not so classic Ferrari. Full details are to be found on the Trade-A-Plane page for this aircraft which you will find if you click here. 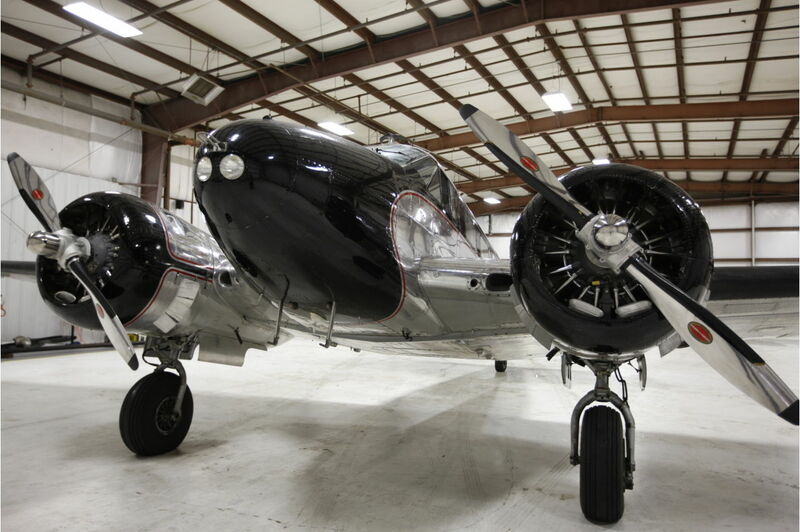 This aircraft offers 1930’s style in a modernized and well maintained plane. It is a highly attractive proposition.